Giving up is the easiest thing to do in the world. Giving up also takes on many forms. Saying you’re done with a side hustle is one thing. Accepting yourself as a failure is quite another. 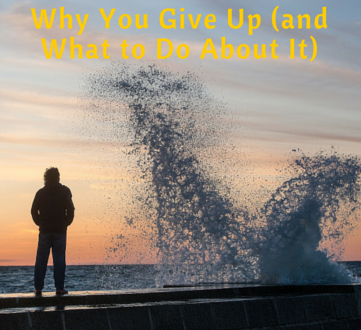 Giving up is also one of the most destructive actions a human can take, with far ranging implications that will negatively affect you for years to come. Some people feel they want to give up on life – that they have no path forward. These people sense no meaning in their current situation, or in their future. This is the most extreme mindset, and one that can lead to anxiety, depression or worse. Life can overwhelm even the strongest people. Every man needs support at one point or another. You might get caught up in trivial matters, or worse – feel like everything bad the can happen does happen. Without the proper mindset, these burdens can push you to the brink of a breakdown. Thankfully, you can draw upon an extreme example of a hopeless situation. Below, I’ll describe how one man overcame a harrowing experience and dedicated his life to helping others find out what to do with theirs. Viktor Frankl wrote “Man’s Search For Meaning” in 1959. The book thoroughly examines the brutal lessons he learned in multiple Nazi death camps during World War II. Frankl grew up in Vienna, Austria and was a physician, neurologist, and psychiatrist before the war. 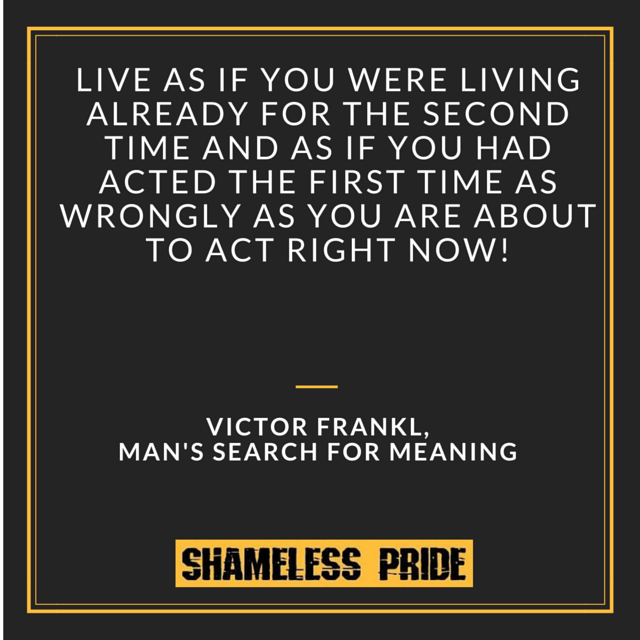 As life began to get worse for the Jews of Austria, Frankl was steadfast in his refusal to leave the country because he of his elderly parents (he declined a visa to go to the U.S.). Frankly stayed in Austria and in September of 1942 got swept up in the carnage of the Holocaust, sent to a concentration camp with his entire family. He survived, but his entire family perished, including his young, pregnant wife. In the book, Frankl examines the mental characteristics of those who survived and those who did not. These observations led him to develop a theory called logotherapy, the belief that man’s primary motivator in life is the pursuit of meaning and fulfillment of one’s life. Frankl argues that even when life seems hopeless (as his did for several years), you should NEVER GIVE UP. Life has meaning under all circumstances. It’s hard to imagine how someone could retain the slightest sense of optimism in such a horrible situation. Did Frankl’s education and work experience help him persevere? Most likely. However, he also used visualization techniques, constantly thinking about seeing his wife and family again – even extravagant spreads of food – to get him through the hardest of days. What does it mean to find a meaning in one’s life? Frankl argues that it differs from person to person, and changes depending on a person’s point in their life. One’s meaning is not static, but always adapting as a person ages and grows. Your life has meaning, no matter how down you may feel. When you break down human nature to its basic core – logotherapy makes sense. Humans crave meaning in life, the belief that what they do matters. Money, fame, greed – all these desires are secondary, and a product of the modern world. 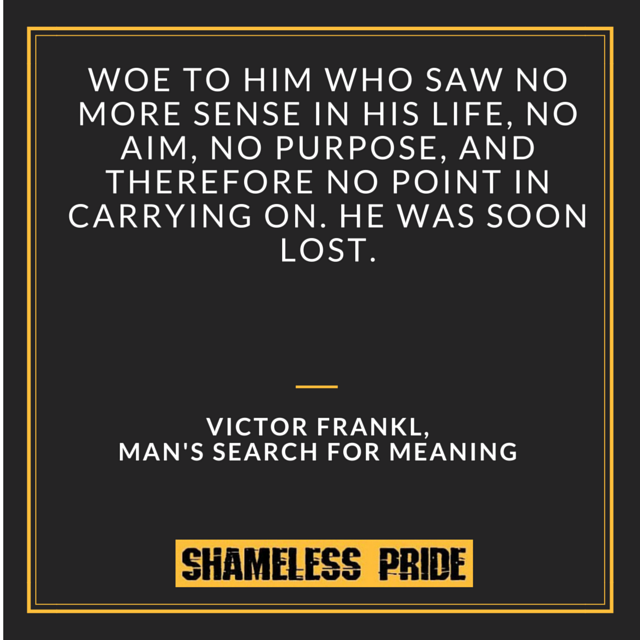 Finding your meaning is a central theme on Shameless Pride. It’s not okay to go through life living someone else’s dream. It’s not okay to have no sense of purpose, or no excitement for the future. Life is too short, and the opportunities are too vast. Realize that your destiny is your own, and that the responsibility to march on no matter the obstacle is yours alone. This freedom of the mind is imperative in your journey through life.